Ask anyone at pet-friendly Allegro Medical and they will likely agree that “dogs are people, too…”. We’re crazy about pets. That said, it’s about doggone time we added Pet Supplies to our ever-growing mix of healthy lifestyle products, right? Now you can shop at Allegro Medical for fun and healthy products for your pooches – and kitties too. Find unique “As Seen on TV” pet supplies as well as pet beds, conditioning and training tools, gates, nutritional supplements and more. PetZoom Self-Cleaning Grooming Brush – This “As Seen on TV” pet grooming brush removes hair, dander, dirt and debris from your dog or cat’s fur and then cleans itself with one simple touch! BioPet DNA Dog Breed Identification Kit – Find out the breed makeup of your dog. Swipe the cheek, send in the swab and in 2 weeks you’ll finally know what, exactly, Rover is made of. BioPet identifies 63+ mixed breeds. Brilliant! Roll ‘N’ Clean Litterbox– Super easy kitty litter box cleanup! Just roll the litter box onto its top and then back to it’s upright position. Roll ‘n’ Clean’s unique patented grill inside scoops out the clumped waste and deposits it into a pull-out tray. Voila! No more scooping. Get on the Ball Two DVD – Four easy-to-follow programs for puppy, beginner, intermediate and advanced training. Help strengthen your dog’s lower back and abs so that it can perform any activity with as little risk as possible – from jumping off the couch, to hiking, herding livestock or competing in agility events. UGODOG Indoor Dog Potty – This innovative and environmentally friendly dog potty and house training system makes clean-up simple and mess-free. Better yet, it keeps the house and your pet’s paws dry. Convex beams cushion delicate paws. UGODOG is durable and weather resistant for outside use. Poopsie prefers grass? Check out the PetZoom Pet Park, also “As Seen on TV”. Sure & Secure – Secure Entry Metal Gate – Use it as a baby gate or a pet gate… either way this fully adjustable gate is hardware-mounted and will help you create a secure environment for keeping kids or dogs in… or out. Great for extra wide openings. Nutri-Vet Hip & Joint Peanut Butter Flavor Wafers – Specially formulated to support the structural integrity of joints and connective tissues in dogs. 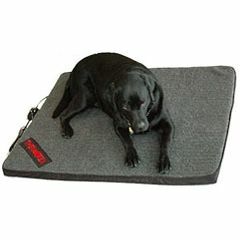 For large dogs of all ages or breeds. Contains Glucosamine. Tricky Treat Dog Ball – Stick yummy treats or dog food into the ball and your dog will be focused and entertained for hours, working to free them. Challenging and stimulating. FitPAWS Peanut for Dogs plus Pump and DVD – This peanut-shaped stability ball is designed for core conditioning and strength training of sporting and working dogs as well as for animal rehab and therapy. Includes a hand-pump and training DVD. Puppy Training Tip: Use disposable underpads as puppy piddle pads! Super economical. Here’s to keeping your pets healthy and happy. Thanks again for your support and your business. We appreciate you! !